Sustainable Sites Initiative has a collection of case studies that illustrate green building practices. 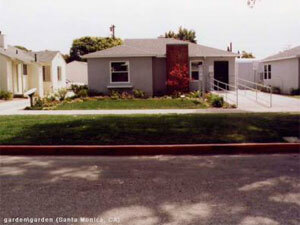 The most interesting to us is Garden/Garden:A Comparison in Santa Monica, where the city installed a traditional front yard lawn garden and a low-water, native, sustainable design garden on adjacent lots so that people could see the side by side comparison. The native garden cost about one third more to install, $16,700 vs. $12,400; that cost difference came from the installation of a DG walkway to replace the existing concrete walkway and installation of rain gutters and a stormwater infiltration pit. The native garden used 77% less water, 283,981 gallons/year vs. 64,396 gallons/year. The native garden generated 66% less green waste, 219 pounds/year vs. 647.5 pounds/year. The house and yard of the traditional garden look like relics from the sixties. I sure wouldn’t want my front yard to look like that, so I salute the owners taking a hit for science. This entry was posted on Friday, January 2nd, 2009 at 6:52 pm and is filed under sustainability. You can follow any responses to this entry through the RSS 2.0 feed. You can leave a response, or trackback from your own site. So the low-water native garden was more to install. But how much are they saving in water per year? How soon would it pay for itself? They had some statistics about the cost of maintenance, but maintenance costs depend more on the homeowner than they do on the installation. An established native garden might need quarterly maintenance to weed, cut plants back, divided perennials, etc…., and it might need annual applications of mulch and a few new plants, or not. It depends on the aesthetic of the homeowner. The traditional garden looks set up for a regular mow and blow, but that can vary a lot in cost. The low-water garden used one quarter the water of the lawn garden. I don’t have the numbers to say how much money that would save; water costs vary from area to area, and are affected by what goes on inside the house. Water is very cheap if you don’t use much, and very cheap if you use a lot. For instance, EBMUD has a $2 surcharge for every 750 gallons that a home goes over its water ration. These gardens used 60,000 and 280,000 gallons of water in a year respectively, so the traditional garden could conceivably have cost hundreds of dollars extra in water, but probably didn’t. This particular native garden installation probably won’t “catch up” in terms of cost, unless water gets very expensive in California. However, it only cost more because of the rainwater gutters, infiltration pit, and permeable hardscape installation, things which the traditional garden should have, but never bothered with. In terms of straight softscape comparison, native plants versus lawn, the native planting would have paid for itself immediately. And in terms of true cost, which includes environmental effects and strains on local infrastructure, the native garden pays for itself even with the gutters, pit, and permeable hardscape. The traditional garden contains costs which are born by the Santa Monica taxpayers, which is why the City of Santa Monica did this demonstration and offers grants to convince people to install native gardens.